As the Federal debt rises, a rising share of the national budget is earmarked for paying of interest. Until recently exceptionally low interest rates for more than a decade have stimulated the increase in the debt of the Federal government because costs were low. The sudden increase in the Federal debt in excess of the GNP, and rising, must be construed as one of the primary indicators that there has been a major degradation in the health of the U.S. economy. Investors should accept that as a serious warning that the economic health of retirement funds may be threatened. With rising Federal budget deficits increases in the Federal debt are likely. The most likely outcome will be a continued devaluation of the U.S. currency along with growing inflation of consumer prices. The dollar magnitude of the growth in the debt should be seen as an indication of the severity of debt obligations, especially in view of low levels of debt only thirty years ago. Since the end of WWII the total public debt was kept at low levels. Any debt was quickly retired. The big rise in debt took place after the 2000 recession, when the debt tripled. This trend continues, at an accelerated rate. 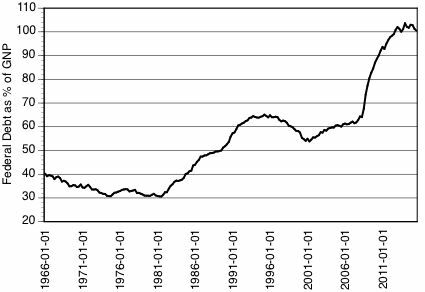 SOURCE: Office of Management and Budget, Federal Debt: Total Public Debt as Percent of Gross Domestic Product [GFDEGDQ188S], retrieved from FRED, Federal Reserve Bank of St. Louis https://research.stlouisfed.org/fred2/series/GFDEGDQ188S, February 15, 2016. CONCLUSION: The rise in interest payments in the federal budget shows corresponding large increases in the last ten years even while the interest rates have been kept deliberately low. With interest rates rising and debt rising in excess of GDP seniors will be increasingly taxed to keep the public debt within acceptable limits.